Before returning to Spokane, we had one more show to attend in Kennewick, Washington for the 80th annual Richland Kennel Club Fall Dog Show. It is one of the biggest events of the year for the area; over 1,000 dogs and 3,000 fans gathered in the beautiful Columbia Park to watch and participate. However, this year the weather was a cold and very wet! The dogs did not seem to mind the weather, as they were happy and playful like usual! The humans on the other hand tried to stay dry and a good place to do so was under the Paw Print Genetics tent! We spoke with a variety of owners representing different breeds. Many of these folks recognized us from other local shows and catalog advertisements. We filled them in on what makes us different from other laboratories and how we do genetic testing the right way! After the show, I returned to Spokane for one week and then packed up everything including Lisa Shaffer, PhD, our founder and CEO. This time the destination was Olympia, Washington for the Labrador Retriever Club Inc. National Specialty Week. At this outdoor show Mother Nature displayed all types of weather patterns. There was wind, rain, thunder, lightning, hail, and even some sunshine! Of course the Labradors were happy, as they did not seem to mind the crazy weather! Attendees from all over the US and Canada traveled to the Pacific Northwest with their talented dogs who competed in the ring and in the field. Our Labrador Retriever Panel consists of 11 genetic tests including exercise-induced collapse, PRA-PRCD and centronuclear myopathy. The show attendees were very interested to learn about our panel testing option. These owners realized that they could get a great deal on the panel tests and in return get more information about the genetic health of their dog. They also appreciated the method of cheek swabs to obtain DNA. 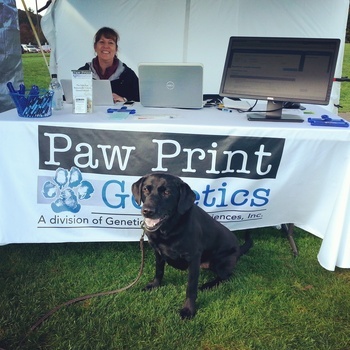 Next on the agenda for Paw Print Genetics is a convention in our hometown, Spokane, Washington! We will be exhibiting this week at the Association of Professional Dog Trainers. We hope to connect with dog trainers, veterinarians and other canine professionals to spread the word about optimal canine genetic health and inherited disease testing.